A thick and hearty vegetarian and vegan stew recipe made with whole grain freekeh, sweet potatoes and leafy green kale and rounded out with chickpeas to make it a full meal. This freekeh stew recipe has plenty of healthy fiber and protein from both the freekeh and the chickpeas. Recipe and Photo reprinted with permission from the "30 Ways to Freekeh!" cookbook. See also: What is freekeh? First, pre-heat the oven to 475 degrees. Next, prepare the sweet potatoes. Scrub the sweet potatoes and then chop them into cubes about 1-inch in size. Line a baking sheet with foil, and arrange the sweet potatoes on a single layer. Drizzle the sweet potatoes with a bit of olive oil. Roast the sweet potatoes in the oven for 25 minutes or until tender. When done cooking, remove them from the oven and set aside. While the potatoes are roasting, pour all the remaining ingredients into a large pot over high heat stovetop. Stir to combine and cook over medium high heat for about five minutes. Reduce heat to on top of the stove over high heat. Stir with a spoon and heat for about 5 minutes. Reduce heat to low and add roasted sweet potatoes. Cover partially and simmer for at least 30 minutes. Check occasionally and give a stir. Continue to cook longer for richer flavor, adding water or more broth if desired. Recipe variations: Try using fresh oven-roasted pumpkin or butternut squash instead of sweet potato for a healthy and delicious freekeh and pumpkin or freekeh and butternut squash stew. Another idea? Add a little nutritional yeast on top of your stew for a vegan "Parmesan cheese-like" flavor without the fat and without the dairy. 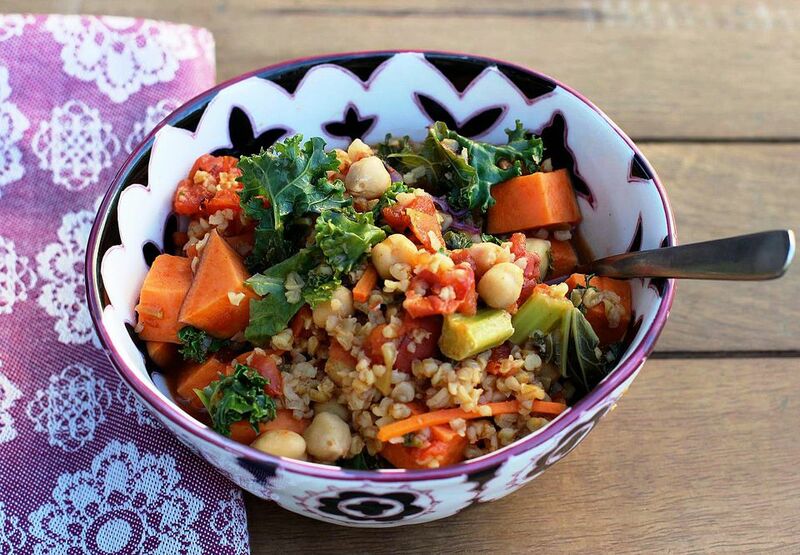 Enjoy your homemade sweet potato, kale and whole grain freekeh stew!